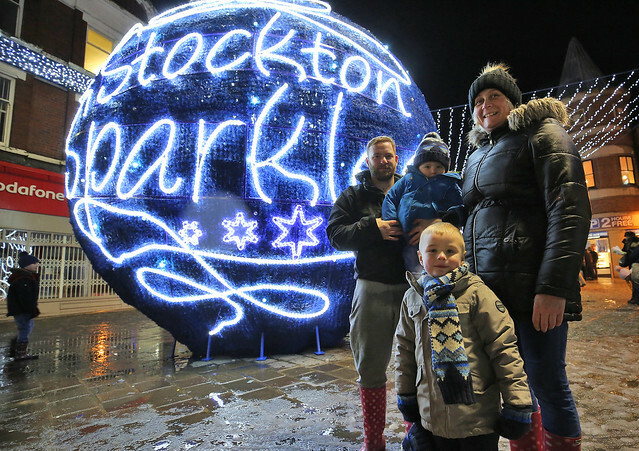 Stockton Sparkles returned with a packed programme of activities and events, bringing some extra special festive fun to the town centre. Launching in style with our annual Christmas Market and lights switch on event, thousands of people braved the weather to pack Stockton High Street for our Launch of Sparkles event on 30 November. The return of Stockton's Singing Christmas Tree - led by Wildcats of Kilkenny front man Mike McGrother who was joined by Guitarist Dan Donnelly of The Wonder Stuff and Apollo Street Band - was the highlight of the evening and helped to entertain the crowds with a series of Christmas songs in the build-up to the lights switch-on. The Christmas Market also returned to a snowy high street, with over 30 traders bringing a festive mix of hot food and drink stalls, craft traders, Santa's postbox, face painting and more! Our Sparkles Christmas Market returned for four days bringing 30 fantastic festive cabins stocked full of gifts, edible treats and food. Visitors to Stockton also enjoyed a variety of street theatre acts to entertain shoppers on the High Street throughout Stockton Sparkles. Our unique and festive programme brought even more Sparkle to Stockton High Street! Performances included some truly unique shows bringing giant penguins, a snow lion, gliding angels, acrobatic elves, a snow queen, giant balloons, hoverboards and magic to the town centre! Stockton town centre once again hosted a magical Victorian Fair with residents and visitors able to take a ride on our charming carousel and Ferris wheel. Located in the central area of Stockton High Street, both rides were free of charge and helped bring some festive cheer to the town centre. Santa and his reindeer arrived in Stockton as part of Stockton Sparkles to help spread some Christmas joy and cheer. A bumper crowd packed into the town centre for our fantastic community Reindeer Parade, as local schools and community groups led the sleigh along the High Street in a flurry of beautiful costumes and outfits, while Apollo Arts entertained the crowd with live music. There was also an opportunity for everyone to meet Santa’s Reindeer whilst they rested outside Stockton Town Hall whilst enjoying plenty of festive song and dance! The Gift saw volunteers come out in force in support the vulnerable and alone in our Borough at Christmas. The event gave people the opportunity to donate gifts, or time, to help support those in need. A special thank you to everyone who donated towards making The Gift a fantastic success. Visitors came along to our High Street marquee on Saturday 16 December to donate goods, wrap gifts, make decorations and write Christmas cards. And the generosity of the people of Stockton-on-Tees and the surrounding areas, helped to make a real difference to those in need this Christmas.